• Read your assignment and consult with your instructor to make sure you're clear on what's required. • Video assignments in different courses can be very different and can have different goals. Make sure you're clear one what your instructor expects from you and expects you to learn. • The steps given here may differ a bit for your assignment. Initial steps: Do some background reading and play with ideas until you have a general plan for what you want. • First, find out what equipment and resources are available. • Here is some information on research at Lehigh. Determine what you need to research, both for subject matter and technical things, and begin researching it. • Take good notes and keep a careful record of your sources. • Search Lehigh's ASA Library catalog. • Scout out locations for shooting. • Take photographs to help plan your shots. • Get written permission to shoot at your chosen locations. • A storyboard is a visual plan of what the video will be, scene by scene, drawn on paper or whiteboard. 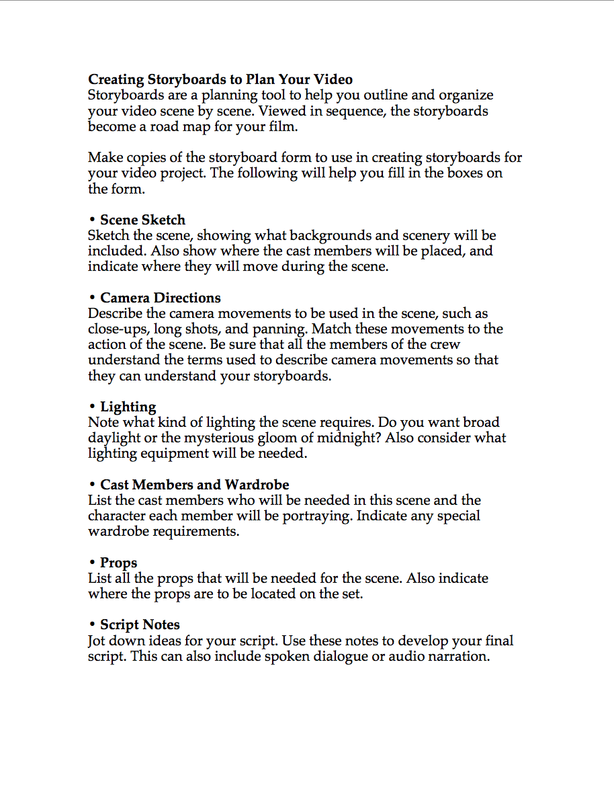 • Here is a description on what to include in storyboards. 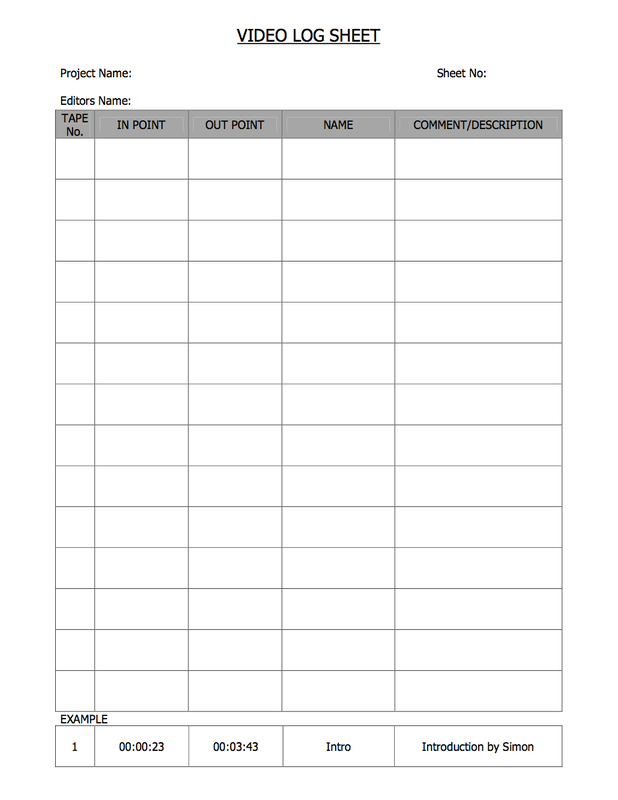 Download a blank storyboard form. • Production elements include all of the techniques that pull the video together. • And they include audio techniques, like dialogue, music, voice-over narration, sound effects, and how you use the microphones. Do more research and gathering. • Again, keep good notes and keep a careful record of your sources. • If you want to, gather public domain music, video, and images to use in your project (but double-check its copyright status). • For images, a safe place is Wikipedia and Flickr Creative Commons as long as you filter by use type. • For music you can use the Omnimusic library at the Digital Media Studio. The library is tied to our IP addresses of the Mac computers at the lab so you can only download songs from there. The production checklist (copy and paste into Word). Lehigh's STARS can be helpful with these steps. • Get all equipment (You can rent video equipment for free from the Digital Media Studio). • This includes camera work, lighting, and sound recording. • All your shots should already be planned in your storyboard. • Make sure you keep a careful log of your shots to make the editing easier. • Review our video basics tutorial for good tips on filmmaking. Post-production phase one: rough cut. 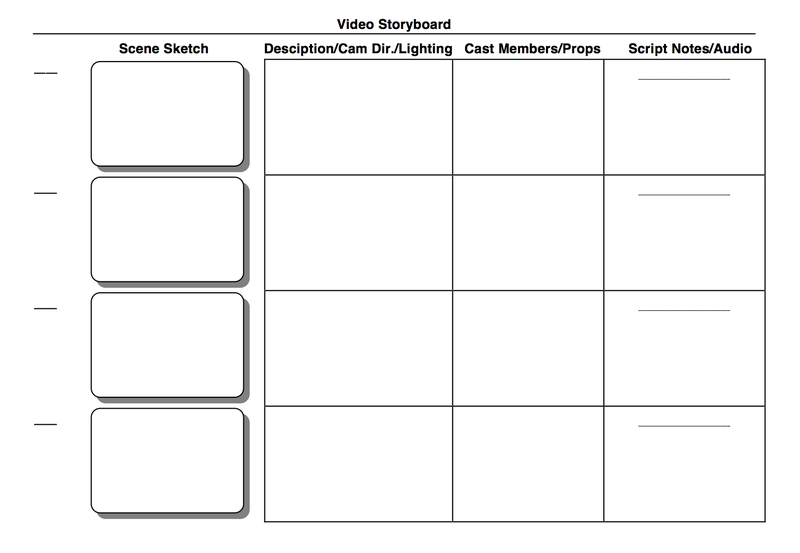 • This is where you actually first put together your video, following your storyboard. • Here are some good tips for better video editing. • If you kept a good log of your shooting, it can be helpful in this stage. • Besides combining shots, this is also where you might add narration and music, sweeten the sound, and use sound and visual effects. • Lehigh's Digital Media Studio can be helpful with the editing software in post-production. • Do a screening of your video to one or more people who are not involved in it. • Do not explain anything about your film before you show it. The film should explain itself, and this is a way to find out if it does. • Plan to make changes based on their feedback. • The reason this is important is that when you're very involved in a video project, it is hard to know how someone will see it who has not been living with the material intensely already. • You may want to do some reshooting based on feedback you get at your screening. • Follow all of the guidelines of shooting that you followed before, including using a log sheet. Post-production phase two: final edit. • Do your final edit. Do a test run of the final presentation. • Doing a test run with some time left for fixing problems is a good idea.